Donations of food from grocers, food distributors, farmers, and community members provide a much-needed supplement to the food we receive from government agencies. You can help by donating nonperishable foods and fresh produce. Check with your financial advisor to learn more about the tax benefits associated with donating food. The Federal Bill Emerson Good Samaritan Food Donation Act protects those who make good faith donations from liability. It’s crucial to our community. Every day, we become more aware of the staggering need for emergency food in our community. In 2017, we distributed over 32 million pounds of fresh fruits and vegetables to families in need. We do not accept milk-based soups, fresh shellfish, home-prepared foods, or foods that have been placed in a buffet serving area. *We follow strict warehouse standards and safe food handling practices. SK Food Group has been a food donor for three years and all coordination is done by Josh Spriggs. 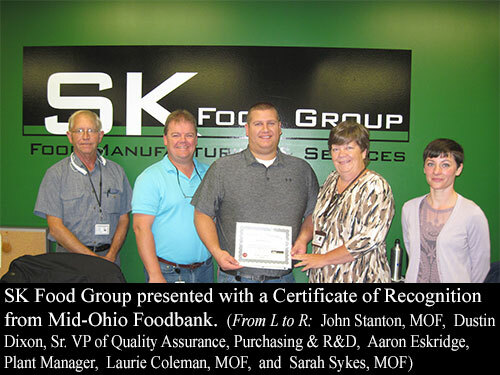 SK Food Group to-date has donated over 319,687 lbs of nutritious food to Mid-Ohio Foodbank. The donated product has included frozen breakfast and lunch sandwiches. Recently, Aaron Eskridge, Plant Manger, invited Mid-Ohio Foodbank employees to tour their state-of-the-art USDA certified manufacturing facility located in Groveport, OH. Before the tour, SK Food Group, represented by Dustin Dixon, Sr. VP of Quality Assurance, Purchasing and R&D, and Mr. Eskridge, was presented with a Certificate of Recognition for their commitment to Mid-Ohio Foodbank and for making a difference in the lives of hungry neighbors. Thank you so much to SK Food Group, our Donor Spotlight. The demand for food assistance in central and eastern Ohio continues at record levels. By holding a food and/or funds drive, you can help our friends and neighbors when they need it most. Make the most of your efforts. Offer potential donors the opportunity to contribute cash instead of shelf-stable food items. Remind them that every $1 donated can provide $10 worth of food and groceries. KIDS’ PACKS – Focus your collection efforts on children by assembling Kids’ Packs. Kids’ Packs include foods to make a meal, beverages, healthy snacks, and personal care items. If the amount of food collected/grown can fit within a personal vehicle, please deliver it to loading dock #1 on the east side of our building Monday through Friday between 8:00am and 4:00pm. A staff member will help you unload your donation, weigh it, and provide a poundage receipt. If the amount of food collected/grown exceeds what will fit into a personal vehicle, please call 614.277.3663 or email us to arrange for pickup. Gardeners should make arrangements to deliver their produce directly to their neighborhood walk-in pantry. You may also bring your donations to Mid-Ohio Foodbank Call 614.277-3663 to find a pantry near you. Participate in Plant a Row for the Hungry, a program designed to encourage gardeners to plan an extra row of produce each year to donate. To donate surplus crops, please email Dave Daniel or call 614-317-9470. Your excess produce may be packed in cases, bins, or bushel crates. You are not required to give detailed information about the produce you provide, as long as it is donated in good faith. Mid-Ohio Foodbank distributed nearly 60 million pounds of food last year, enabling food pantries, soup kitchens and emergency shelters across 20 counties to provide food for more than 140,000 meals each day. But we can’t do it without your help. Let us pick it up. Our docks can accommodate semis and large straight trucks. Please call 614.277.3663 or email us at FOODDONATIONS@MIDOHIOFOODBANK.ORG to arrange for drop-off. More than 14 billion pounds of fresh produce are left in the fields each year. Yet, 1 in 4 of our children are hungry. Produce is one of the best products for Mid-Ohio Foodbank to distribute, not only because it is wholesome and nutritious, but also because it is the most readily available. We work with farmers to secure and distribute fresh produce to more than 200,000 families at food pantries and produce markets across central Ohio.